Has anyone tried crunching Milkway@ with a AMD FirePro S9150? On paper, it looks like it should scream through WU. But, Top GPU states it nowhere to be found. Message 67326 - Posted: 12 Apr 2018, 0:05:12 UTC - in response to Message 67325. There are statistics for that board here but I do not think it was optimized for multiple WUs as the times appear to be single Wu times. No way to know for sure from the data. I have an S9100 that I got fairly cheap, $300 free ship "new". I ran some tests and it seems to be 2x as good as HD7950 but it over heated and I did not want to do water cooling as there is more to the board than just the GPU. I am waiting on this cooling fan with shroud duct. 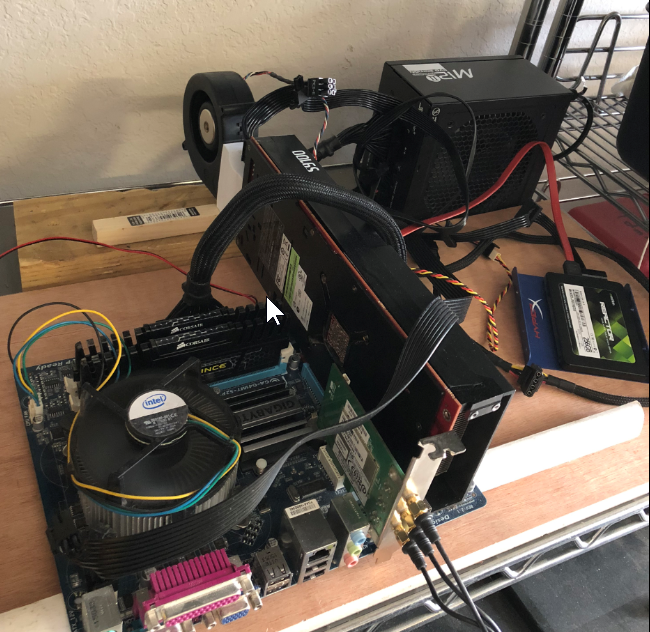 Although a "Tahiti" class, it appear to required 2.0 OpenCl but a test I ran caused real problems with adjacent HD7950 when testing so the board will have to be in an old mATX motherboard all by itself. The board has a miniature Display Adapter hidden behind the vent but it did not function for me. I am guessing it was used for testing and then disabled. The mATX has on-board video so it will boot up unlike the S9100. Not all motherboard worked with my S9100. There is a list of compatibly motherboards for the w9xxx somewhere as I racall. Should work with S9150 except no video. I run AMD S9150 that I got from newegg under Linux. For one work unit (default setting), it is about 600+ GLOPs. I set the file app_info.xml to use multiple Work Unit on the same GPU based on this tip in this forum. It is about 1300-1600 GLOPS with 4 Work Unit running on the same GPU. In Linux, the card AMD S9150 is detected as W9100 by AMD driver. You can see this with `lspci` or `clinfo` command. Maybe that is why it is reported as W9100 on Milkyway@Home webpage. Not 2x improvement like I hoped. Basically my S9100 can do a little over 5 WU in the time it takes an HD7950 to do 4. If the HD7950 is doing 5 then the S9100 finishes 30 seconds earlier. First blue highlight shows 2 concurrent tasks. Second blue highlight shows 3 concurrent tasks. last blue highlight was a single tasks for comparison. It shows 57 seconds and I ran several single tasks (not shown) that gave 55...61 seconds to complete. The green (under the last blue) and the remaining 9 purple are the "10" tasks. Not shown are the "20" concurrent tasks. After 5 concurrent tasks there is basically no improvement. 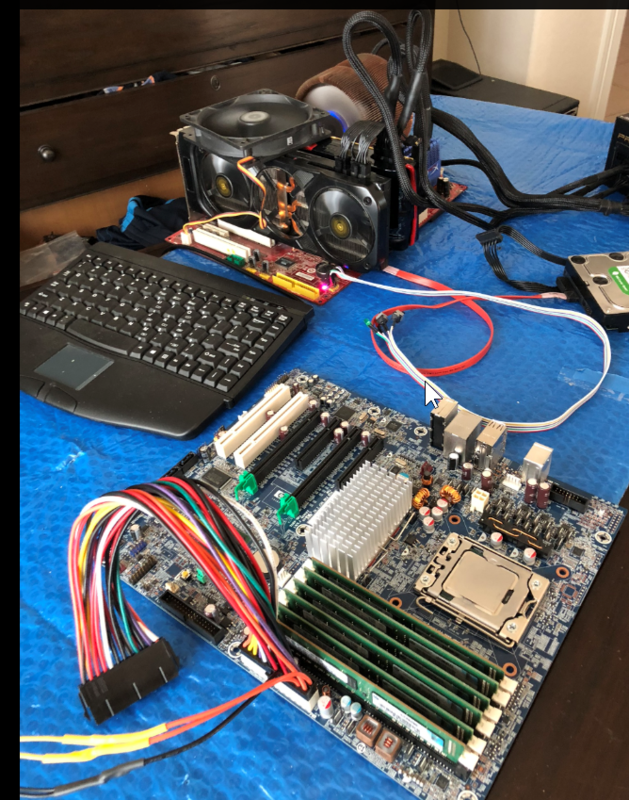 This system is a Q9550 core 2 quad so CPU will quickly dry up if I run to many and all that would happen is the video board would get hotter but still product basically 5 work unit in almost exactly 3 minutes. Note sure if the S9150 would be better. I could also try the "15.201.2401" that is designed for the S9100. The driver I am using was the Micro$oft recommended update but does not work with GPU-Z and not all of the sensor information is shown: Temp and GPU clock are "0". Windows 10 thinks I have a W9100. I may try that other driver later. Lemme know if My calculations are off. Message 67333 - Posted: 15 Apr 2018, 12:33:26 UTC - in response to Message 67331. For example: I am the one in the middle and the one below me is an S9150 system. That system has only a few invalidates. It does have a different driver but is windows 8.1 and the drivers are not listed for windows 10x64 for the s9150 unlike my S9100 which does have support for windows 10x64. I downloaded driver 1800.12 thinking that would help with my 5 at a time work load. It did not, the percent of invalid tasks decreased but was still present. I have run multiple tasks on HD7950 and HD7850 for a long time and had a total of "2" invalid so it appears the driver for my Firepro has a problem. I asked at the AMD forum for help and possibly a diagnostic program but running one at a time seems to have fixed the problem so far. Message 67336 - Posted: 15 Apr 2018, 22:44:14 UTC - in response to Message 67333. It could be a memory problem with the card, windows or even the software, every workunit uses memory and maybe something isn't releasing it in time to crunch the next workunit so it's having problems. Hello, just this very night I setup my S9150 card. Windows 10 Pro with appropriate driver from AMD. "15.201.2401-whql-firepro-retail"
My trouble is BOINC does not see the GPU. I am not sure why. 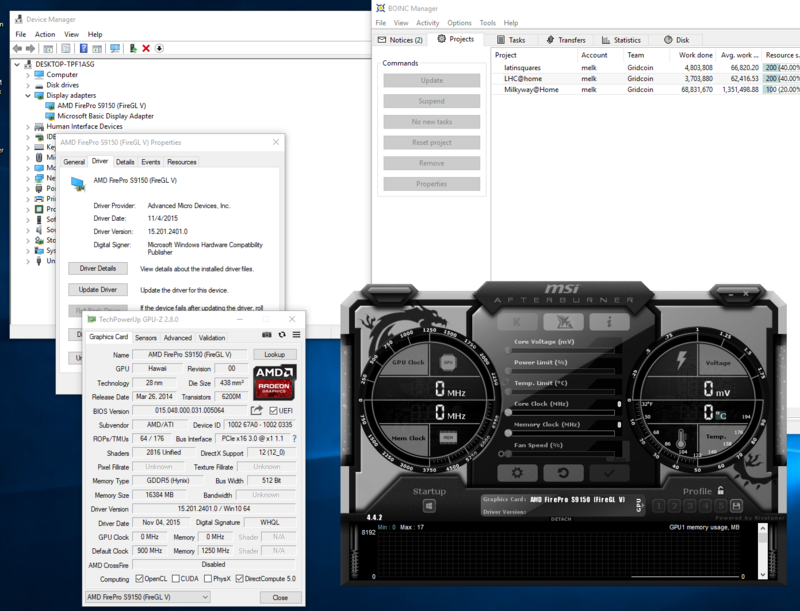 Windows, GPUZ, and Afterburner all see the card. Attached pic. edit: I have deleted and reinstalled latest BOINC app, still does not see the card. Message 67341 - Posted: 17 Apr 2018, 8:38:13 UTC - in response to Message 67340. Your GPU-Z shows "0" for frequency. I got the same result with that driver. It was recognized but temp and clock were "0"
I found a better driver "18.Q1.1" dated march 2018. Those other ones were 2015, really old. Look for the W9100 driver which is the enterprise "18". Buried down in the release notes is the support list quote: "+all other AMD FirePro™ S series products"
I am still getting invalid tasks even with this driver but ONLY when running multiple concurrent tasks. Unaccountably, my "count" of invalid tasks dropped from about 124 to 59. i have no idea why some Went missing. Somehow they were removed from the database. Also, I just enabled ECC for the memory. I didn't see any errors yet. I am doing 2 at a time so there should be a very few invalids. Message 67343 - Posted: 17 Apr 2018, 10:44:27 UTC - in response to Message 67340. Try restarting the pc and make sure a monitor or "dummy plug" is plugged into it. Message 67344 - Posted: 17 Apr 2018, 11:49:38 UTC - in response to Message 67343. The S9150 has no video outputs. I will try the newer driver. Thanks. Message 67347 - Posted: 17 Apr 2018, 15:47:36 UTC - in response to Message 67344. It is possible to tell how many work units are processed concurrently as that is recorded in the work unit log "Stderr output". I checked my wingman who has an S9150 and they are doing 5 at a time not 2 like I was guessing incorrectly. If having a problem with too many pre existing incorrect AMD drivers use DDU (device driver in-installer) to get rid of older AMD drivers. I had to so this on a system I had been testing S9100, S9000 and HD7950 as windows 10 had developed into a driver hell. That AMD Cleanup utility did not work for me and DDU was needed. I am going to try to get up to 5 units to work concurrently as that is what IKE was able to do and his invalid count is really small. Message 67352 - Posted: 18 Apr 2018, 14:06:25 UTC - in response to Message 67347. Well I've run DDU and cleared out all the old drivers, then successfully updated to the new 18.x drivers. Message 67353 - Posted: 18 Apr 2018, 15:19:05 UTC - in response to Message 67352. What does BOINC's event (message) viewer show at startup? What does the Device Manager show for Display Adapter? Did the Radeon Pro control get installed? ALSO IN REGARDS TO AN EARLIER POST IT SEEMS THAT ALL WORK UNIT RESULTS SAY THAT 5 WUs were used so I was correct in assuming my wingman was processing only 2 at a time. I have no idea why 5 is shown on every ones task result page. Message 67354 - Posted: 18 Apr 2018, 15:46:41 UTC - in response to Message 67353. I appreciate the help BB. I'll attach some screenshots when I get home tonight. The only other thing that is odd about my setup is that it's a Tyan motherboard and I'm just using the generic win10 display driver for the onboard VGA. I guess I'll see if I can find a more specific driver for it. 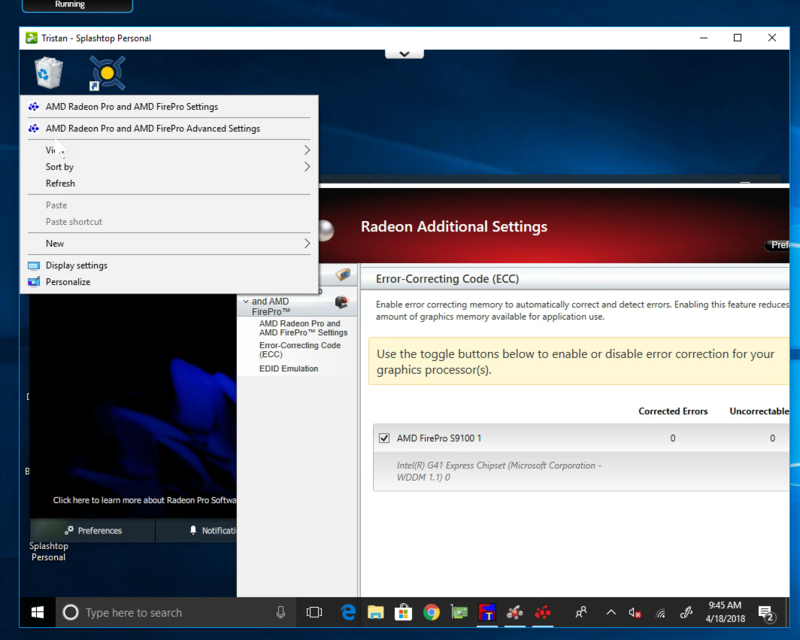 Not really sure that would affect the discrete GPU as Windows Device Manager and Radeon Pro app see it just fine. Message 67355 - Posted: 18 Apr 2018, 19:15:54 UTC - in response to Message 67354. I tried my S9100 in an ASUS IBIBL-TX motherboard which is an HP Burbank. I pulled out the GTX-770 my son had and put in the S9100 just for testing. It booted windows but the S9100 was not recognized, not even in the system manager. It was as if it never existed. I even checked to see if I failed to put the board in the PCIe socket. It did work fine on an MSI-P7N (socket 775, 750i chipset) and also on my unused Gigabyte G41 uATX where it is now located. I did not try it in a Z400. If it shows up in the system manager or in gpu-z it should be recognized by BOINC. If it does not show up like on my HP Burbank then the problem is obvious. I used to have several Tyan dual cpu opteron otherboards . Some had built in ATI Rage graphics. Could be the drivers are working only for the builtin ati chipset and ignoring or confusing your S9150. Some pecularities: The S9000 had a Display Port but will not display the post information. 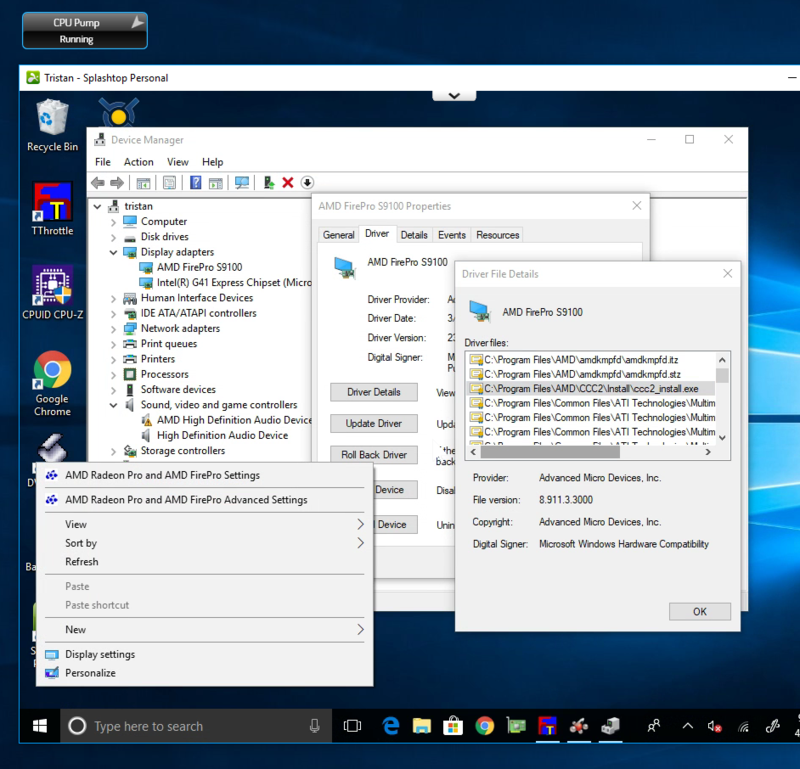 If the system is configured for 7 or 10 then windows boots ok. One must install windows using a standard desktop graphics card then swap the card out for the S9000. I have a pair of S9000 in my MSI-P7N and they never show post information when booting. OTOH, S9100 will not boot at all as the motherboard senses no video. My S9100 has a mini display port that does not function and I spend a lot of effort trying to get it to work. Success! BOINC app had been installed in default Service mode. Can't believe I overlooked something so simple. Currently cranking away :) Time to complete 1 task seems to be 00:44-00:54 seconds. Going to experiment with multiple WU next. My other AMD cards each run 4 at a time. Can't get nice smooth usage graphs no matter what I tweak however :( This card seems more consistent. I'll have to make another post detailing that information. So far with 4 WU running concurrently they are taking around 01:50 to complete. Message 67384 - Posted: 23 Apr 2018, 13:02:31 UTC - in response to Message 67357. I had been running 4 tasks on the card with the same sort of spiky intermittent GPU utilization I've seen on my other cards. 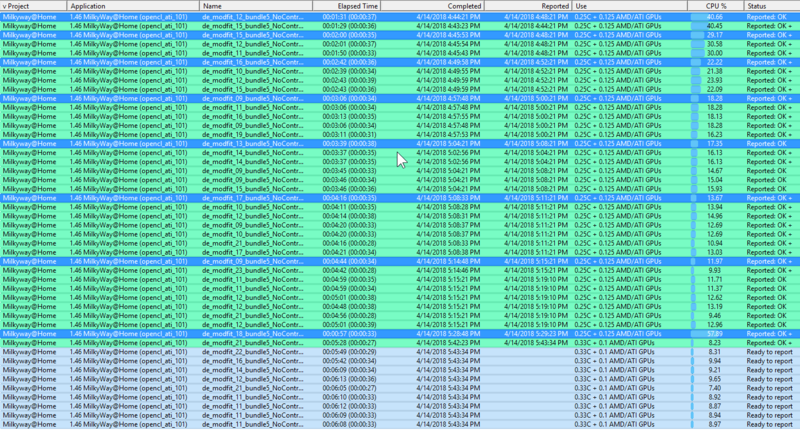 Bumped the config to 8 tasks and finally I see nearly 100% consistent utilization with only very periodic drops. Much much better than it was. I will need to update my other cards as well. Interestingly, none seem to report very much VRAM usage at all. Message 67393 - Posted: 24 Apr 2018, 14:45:53 UTC - in response to Message 67384. Good to hear you got it working. Have some questions and an observation. What are you using for cooling? I got a blower attachment from a 3d printer guy on ebay, but it made so much noise I put the system in my garage. I am thinking of using a CPU liquid cooler and attaching it using a NZXT adapter. I have an RX-560 in a Desktop Ubuntu 17.10.1 system and I read here that this same AMD PRO driver supports the "AMD FirePro™ S-Series" I may take it off that uAtx motherboard and put it into my desktop Ubuntu system. I will not fit with that blower attachment. I started using a Desktop Ubuntu system when I discovered that the windows version of the gridcoin wallet had serious bugs. Your system also has the same problem with invalid tasks as mine. Your count is at 349 and slowly climbing. I hardly get any invalids on my HD7950s nor on my S9100 if I run 1 at a time. I am running 4 at a time right now and I suspect these S series are much faster and there is probably a bug in the OpenCL code Milkyway is using when scheduling tasks into and getting results out of the graphics board. Liquid cooling is great but one thing to look out for when adapting it to GPU is that those adapters typically do not cool the VRM at all. I fried my old GTX 970 after attaching a NZXT Kraken bracket. Cooled the gpu core wonderfully, but one day the card died. Granted the PC was essentially stuffed in a cubby with little to no airflow so that did not help. Point still stands tho, you'll probably want at least a small fan blowing over the VRM's. I'll need to look into the Invalid tasks more. I have been running my Gridcoin wallet on Win 10 from day one, just over a year now. No real issue. There was a rather big update a few months back that greatly optimized the windows client. Message 67407 - Posted: 25 Apr 2018, 15:15:30 UTC - in response to Message 67394. I think you may be right about the Invalid tasks. I tried running 8 WU per GPU and got all sorts of whacky behavior so I backed it down to 5 and seems to be much better. Time will tell.